Eliyahu Cohen (1924-1965) was born in Egypt to an immigrant family of Syrian Jews. In the 1950s, he became involved in Israeli espionage activities, including Operation Goshen, which smuggled over 10,000 Jews out of Egypt, saving them from violence and persecution. Shortly after arriving in Israel he was recruited by the Mossad to be an Israeli intelligence agent in Syria. A new identity was created for him: Kamel Amin Thaabet, a wealthy Syrian returning from Argentina. To create a convincing spy, Cohen actually lived in Argentina before being deployed to Syria In 1962. He quickly gained the trust of powerful people, making friends with generals and rising through the ranks of the ruling Baath party. Cohen toured Syria’s most sensitive military sites, secretly sending the information to Israel (which many believe was absolutely critical in Israel’s 1967 victory). 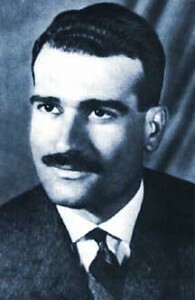 Amazingly, Eli Cohen was nearly appointed Syria’s Deputy Minister of Defence, and at one point, was third in the line of succession to Syria’s presidency! Soviet agents uncovered Cohen’s identity in 1965. Without proper trial, he was publicly hanged to death, and the Syrians reburied him at least three times, fearing an Israeli operation to recover his body. To this day, the Syrians refuse to return his remains. Eli Cohen is considered one of the greatest intelligence agents of all time. His incredible story was captured in the film The Impossible Spy. This entry was posted in Extraordinary Individuals and tagged Argentina, Baath, Egypt, Egyptian Jews, Espionage, Goshen, Hanging, Intelligence, Israel, Israeli Army, Israelis, Military, Minister of Defence, Mossad, Sephardic Jews, Six-Day War, Soviet Union, spy, Syria, Syrian Jews on March 7, 2012 by Jew of the Week.